Our basic Youth pullover hooded sweatshirt made with mid-weight fabric for supreme print ability and softness. 80% Cotton/20% Polyester with 100% cotton 20 singles face yarn. 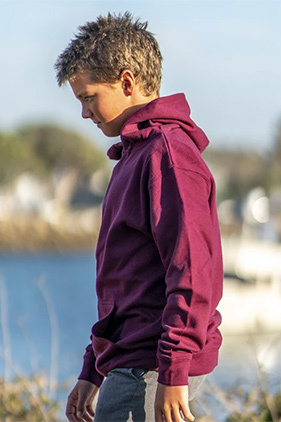 8.5 ounce youth hooded pullover. Jersey lined hood. Split stitch double needle sewing on all seams. Twill neck tape. 1x1 ribbing at cuffs & waistband. No drawcord. Standard fit.